Structural and decorative, aluminum trim for buildings provides a functional purpose and adds aesthetic flair to any project. 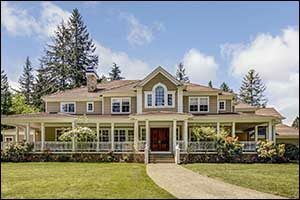 While there are many applications for home trim accents, both indoors and outdoors, the most common use by far is as an exterior accent for single-family and multi-family structures. Door and window frames, porches, and roofs are just some of the examples of how aluminum trim is used in residential construction. Painting, powder-coating, and anodizing aluminum are just some of the most widely used methods for applying aluminum surface treatments to further protect the metal from exposure to the elements and normal wear and tear. Silver City Aluminum is a one-stop shop located in Southeastern Massachusetts. We provide a wide array of professional standard and custom aluminum extrusion services for clients right here in New England and all across the country. We do everything in-house, from working with clients to engineer quality designs for custom extrusion profiles to applying secondary applications, aluminum surface treatments, and even shipping the finished products via our fleet of trucks. By doing everything under one roof, we can not only increase our ability to ensure optimal quality control for every order that we fill but we also significantly improve our lead times compared to the typical industry standard. Our paint line runs almost non-stop, offering our clients the ability to choose any color under the sun for their order. We strive for perfection in all of our painting services to achieve a consistent color application and top-rated adhesion to meet the requirements of every industry we serve. Our pre-treat process goes above and beyond industry standards to ensure superior quality results. The powder-coating and anodizing aluminum services that we offer help clients to choose the colors, textures, and other unique finishing options to best suit the needs of their product. We also do all of this work in-house, providing the best lead times available in the industry and unmatched quality control for home trim accents and other types of custom aluminum extrusion requests. In most cases, aluminum trim for buildings is manufactured through the extrusion process, which involves creating a specific shape by forcing heated aluminum alloy through a standard or custom profile at high pressure. The raw aluminum pieces, which are known as billets, are heated by our team to a specified temperature to ensure the best results. The metal is then forced through the profile, which is also sometimes called a die, at approximately 10 million pounds of pressure. The aluminum comes out in the exact shape that our client has designed or specified to create the desired parts, pieces, or products. The metal is stretched to the perfect dimension while still warm and is then cut according to the client’s requested length. It is then heat-treated to harden the aluminum to its maximum capacity. Once the extrusion process is complete, secondary operations can be applied. For some clients, this means CNC fabrication for long or short parts, punching, precision sawing, mitering, de-burring, heli-coiling, or assembly. We offer a wide range of specialized secondary operations to best meet the needs of the client and the requirements of the industry that they serve. Once the parts are finished and ready for aluminum surface treatments, such as painting, powder-coating, or anodizing aluminum to create aesthetically pleasing home trim accents, they are moved to our painting department. Our team of technicians places each piece on the paint line by hand and removes them one at a time by hand to perform an inspection every step of the way. Compared to other methods of manufacturing aluminum trim for buildings, extrusion is by far the most widely-used among manufacturers. The reason is simple: extruded aluminum can be produced faster and is more cost-effective than other methods, even methods that also use aluminum materials in production. Designing standard or custom home trim accents can be done quickly and easily with the help of aluminum extrusion. You can count on our team at Silver City Aluminum to provide you with top quality, long-lasting, and great-looking results for any project that we complete. Our team of designers, engineers, and technicians are highly trained and experienced to ensure that we meet or exceed the expectations of every client that we serve. If you would like a FREE estimate for our services or are interested in learning more about aluminum surface treatments for home trim accents, please give us a call at 508-824-8631. We would be happy to answer any questions that you might have and help you to place your first order with Silver City Aluminum.